Just released from Community Living Ontario, the new Inspiring Possibilities Estate Planning guide. Below is the press release from Community Living Ontario. Toronto, ON – People who have a disability and their families now have an online, comprehensive toolkit available to them as they consider their financial objectives and obligations. 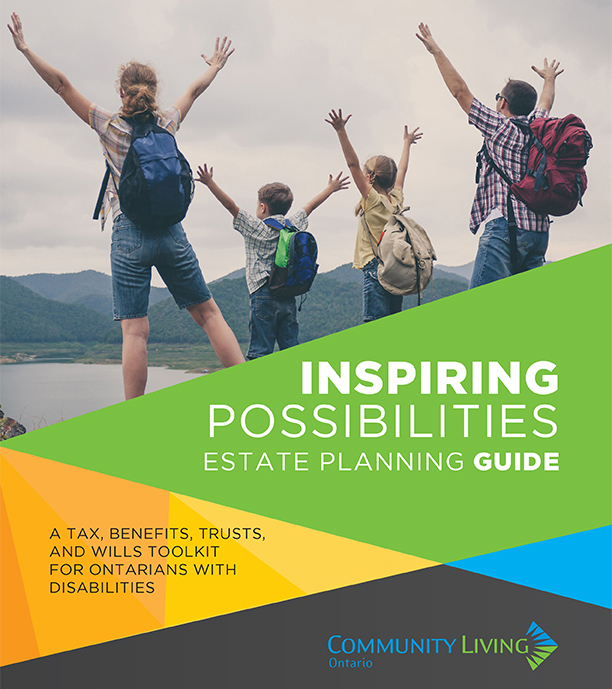 Community Living Ontario launched the Inspiring Possibilities Estate Planning Guide: A Tax, Benefits, Trusts, and Wills Toolkit for Ontarians with Disabilities earlier today. Written by legal, tax and accounting professionals who specialize in supporting people who have a disability and their loved ones, the 112-page, seven-chapter digital book provides pertinent information on various topics including Will and Trust planning, consent, capacity and legal decision-making, the Ontario Disability Support Program, the Disability Tax Credit and the Registered Disability Savings Plan. People who want to know their options and when to seek out professional support can visit www.PlanInspiringPossibilities.ca to download a free copy of the guide. The Law Foundation of Ontario contributed $15,000 towards the development of the online resource. Brendon Pooran will be presenting an overview of the Inspiring Possibilities Estate Planning Guide and answering questions related to estate planning as part of a series of informative sessions geared to families. The sessions are a part of Community Living Ontario’s Conference and AGM and will take place on Wednesday, September 21, 2016 at the Sheraton Parkway Toronto North Hotel and Suites in Richmond Hill. The sessions are free to attend, however pre-registration is required and can be accessed by click here. Community Living Ontario is a family-based association assisting people who have an intellectual disability and their families to lead the way in advancing inclusion in their own lives and in their communities. We are a progressive leader in the Developmental Services sector representing more than 12,000 individuals, families, over 100 member organizations and community partners.